Click the Print or Print Preview commands on the File menu. Click the Print button on the main toolbar. 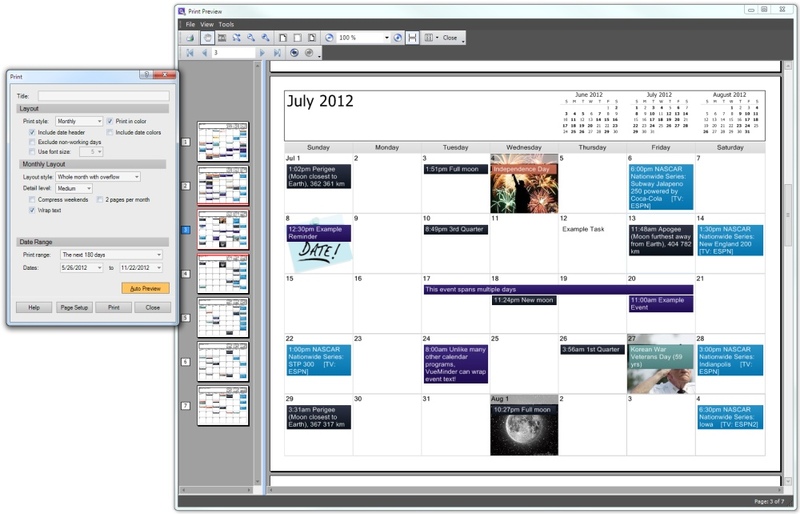 Click the Print button at the top of the desktop calendar. VueMinder provides many different print layout styles and settings, as well as a print preview window that is updated automatically as print settings are modified. After you've selected your print settings, you can continue printing by clicking the "Print" button in the Print window. Try PrintableCal if you're looking for more flexibility when printing, such as a Month layout that can dynamically grow to fit all events, or the ability to customize the printout with logos and branding information. PrintableCal is an add-in for Microsoft Excel, Word, and PowerPoint. It can import events from VueMinder and just about any other calendar app and print those events in day, week, month, and year layouts that you can customize. In some cases, you may have more items defined than will print on a single page. Here are some tips on how you can fit more items into the printout. This is information is primarily intended for the "Monthly" layout style, but applies to some of the other print styles as well. Uncheck the “Include date header” box on the Print window. Click the Page Setup button and decrease the margin sizes. Try 0.3 inches instead of 0.5, if your printer can support those smaller margins. 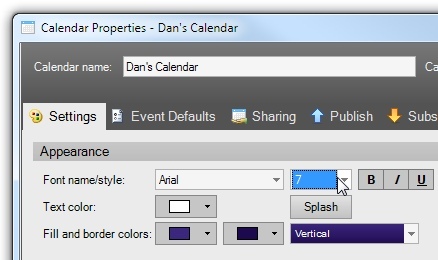 In the Calendar Properties window, decrease the font size. You can access this window by double-clicking the name of a calendar in the calendar list. This will make text smaller on the screen, but should allow more events to fit when printing. You can print the month exactly as it appears on your screen by using the "Calendar View" print style, which can be selected from the drop-down list in the Print window. If you still can't get all events to appear in the Monthly printout, try checking the "2 pages per month" box in the Print window. This should allow much more space and reduce the amount of word-wrapping. It will also allow for a larger font size, which will make it easier to read. After you print, you can crop the margin and tape the two pages together, if desired. A title can be optionally specified. The title will appear at the top of each printed page. You can specify a range of dates to print, either by making a selection from the list, or by entering a custom date range. Note that depending on the selected print layout style, additional dates may be included in the printout. For example, when using a Monthly print style, entire months containing the starting and ending dates will be printed. If a date range of 11/30/2011 to 12/3/2012 were specified, months November, December, and January would all be printed in their entirety. When printing a Yearly style, only the years of the entered date range are used. Even if a print range of a single day were specified, the entire year containing the date would still be printed. Today - Today's date will be included in the printout. Tomorrow - Tomorrow's date will be included in the printout. The next 7 days - The next 7 days will be included in the printout. The next 14 days - The next 14 days will be included in the printout. The next 31 days - The next 31 days will be included in the printout. The next 90 days - The next 90 days will be included in the printout. The next 180 days - The next 180 days will be included in the printout. The next 365 days - The next 365 days will be included in the printout. This calendar month - Dates in the current month will be included in the printout. This calendar year - Dates in the current year will be included in the printout. A range of dates - The specified start and end dates will be included in the printout. The selected dates - The dates currently selected in the Calendar View or Navigation Pane will be included in the printout. All dates - This option is available only when using the List print layout for events, tasks, or notes. Items for all dates will be printed, regardless of date. The starting or ending dates can be modified by selecting a new date from the drop-down calendar, or by typing one in. 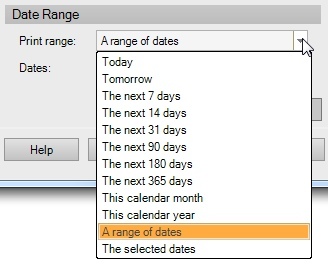 When a custom date is entered, the print range selection will automatically switch to "A range of dates". You can select from a variety of print styles. You can also choose to print in color (if supported by your printer) or grayscale. Some print styles have additional layout settings. These are described in more detail below. 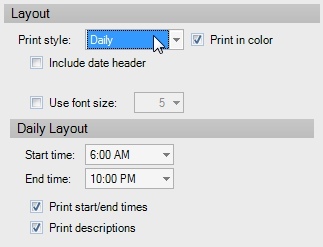 Some print layouts also enable you to choose whether to print a date header and whether to exclude non-working days from the printout. Working days are specified in the Calendar options. The Daily style prints each day within the specified date range. Days are printed one per page. This is the default print style when the Day view is displayed. 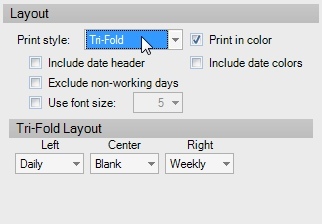 Include date header - Check this box to include a date header on each page of the printed output. The date header will include the printed date and small calendars showing the month containing the printed date and the following month. Use font size - Check this box to specify a font size override. Events, tasks, and notes will be printed using the specified font size. This setting can be used to select a smaller font size than what is displayed in the Calendar View, enabing more text to fit in the printout. Start/end time - Days are printed with time slots. Only time slots between the starting and ending times will be printed. To select a different starting or ending time, choose one from the drop-down list. Print start/end times - When this box is checked, starting and ending times will be included in the text of the event and task boxes. Print descriptions - When this box is checked, event and task descriptions will be included, if there's enough space. 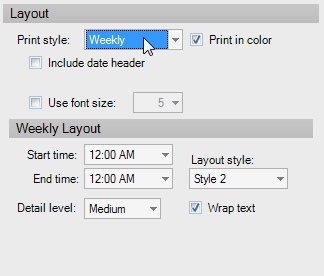 The Weekly style prints all weeks that contain the specified date range. Weeks are printed one per page. This is the default print style when the Week view is displayed. The first day of the printed week is specified in the Calendar options. 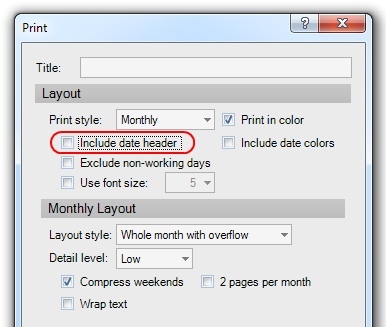 Include date header - Check this box to include a date header on each page of the printed output. The date header will show the dates of the printed week. It will also include small calendars showing the month that contains the printed week as well as the following month. Use font size - Check this box to specify a font size override. Events, tasks, and notes will be printed using the specified font size. This setting can be used to select a smaller font size than what is displayed in the Calendar View, enabling more text to fit in the printout. Start/end time - Each day of the week is printed containing time slots. Only time slots between the starting and ending times will be printed. To select a different starting or ending time, choose one from the drop-down list. All days of the week will print using the same time slot range. Layout Style - The Weekly print style has 3 different layout styles. Style 1 shows time slots for each day of the week. Style 2 shows the week using 2 columns, with Monday through Wednesday on the left, and Thursday through Sunday on the right. Saturday and Sunday are condensed. Style 3 shows each day from left to right, similar to Style 1 but without the time slots. Detail Level - When using Style 2 or 3, a detail level can be selected. Low detail will show item titles and an abbreviated start time. Medium detail will show item titles, start times, and locations when shorter than 14 characters. High detail will show item titles, starting and ending times, and locations regardless of length. Wrap text - Some items might not show all their text on one row, especially when using higher detail levels. Text can be optionally wrapped to show all item details. However, this may decrease the number of items that can be simultaneously displayed within the available space. 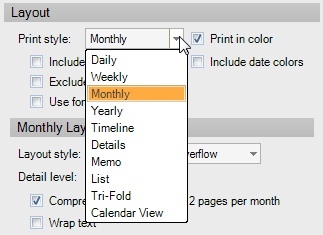 The Monthly style prints all months that contain the specified date range. 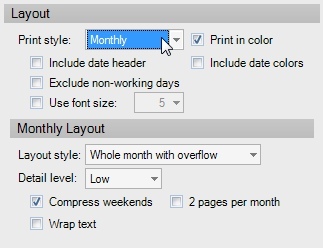 This is the default print style when the Month view is displayed. 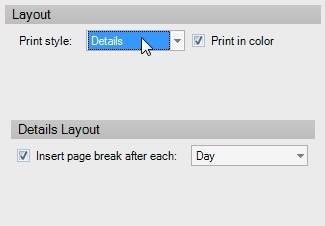 Include date header - Check this box to include a date header on each page of the printed output. The date header will show the printed month and year. It will also include small calendars showing the previous and following months. 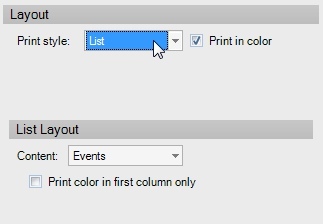 Include date colors - Check this box to color each day header based on the color of the first event occurring on that date. Exclude non-working days - Check this box to exclude days from the printout that are not marked as working days in the Calendar options. This will increase the space available to print events of working days. Five weeks - Each page will print containing 5 weeks instead of a complete month. Whole month with overflow - Each page will contain 1 complete month. Events of dates that are before or after the month being printed on the current page will also be shown. Whole month without overflow - Each page will contain 1 complete month. Events and date numbers that fall outside of the month being printed will be hidden. Detail Level - Low detail will show item titles and an abbreviated start time. Medium detail will show item titles, start times, and locations when shorter than 14 characters. High detail will show item titles, starting and ending times, and locations regardless of length. Compress weekends - Check this box to compress the printout of weekends. This will increase the space available to print events of weekdays. 2 pages per month - Check this box to span 2 pages per month. This option can be used if there are too many events to fit on a single page. The Yearly style prints an entire year's calendar on a single page. Event details are not shown, although dates that contain events will be bold or colored based on the color of the first event occurring on a date. This is the default print style when the Year view is displayed. 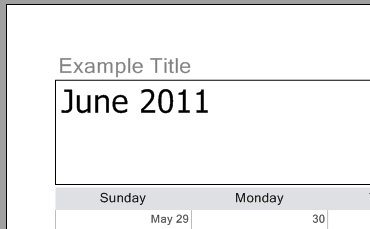 Include date header - Check this box to include a date header on each page of the printed output. The date header will show January - December and the year number. Exclude non-working days - Check this box to exclude days from the printout that are not marked as working days in the Calendar options. 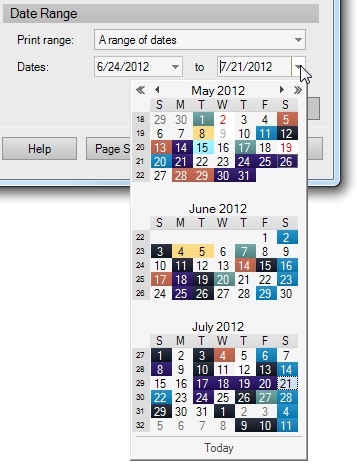 Include date colors - Check this box to color each day based on the color of the first event occurring on that date. The Timeline style prints a horizontal representation of your schedule, with each visible calendar in the Calendar List on a separate row. Tasks and notes will also be displayed on their own rows, if the View menu is set to show tasks and notes in the Calendar View. The horizontal timeslot interval is based on the current setting in the Timeline View. The Details style prints events falling within the specified date range. 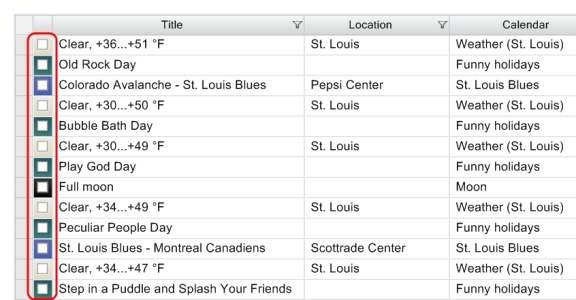 Event titles, locations, times, and descriptions will be printed in a report format, organized by date. A header will be printed for each day containing events, showing the date and day name. 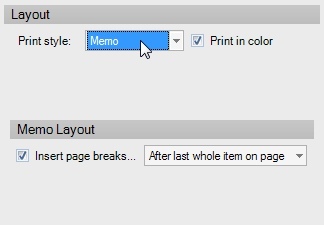 Insert page break - Check this box to have page breaks inserted after each day, week, month, or year in the printed output. The Memo style prints events falling within the specified date range. It's similar to the Details print style, but instead of headers being printed for each day, this information is included with each event. Event titles, locations, dates, times, descriptions, and recurrence patterns will be printed in a report format that is similar to the print style that some email programs provide. Insert page breaks - Check this box to have page breaks inserted after each event or after the last whole event on a page. The List style prints events, tasks, notes, or contacts exactly as they appear in the List View, including visible columns, sort order, filters, and row grouping. This is the default print style when printing is commanded while the List View is active. The list will be scaled to enable all columns to fit within the page. Content - You can select whether to print events, tasks, notes, or contacts. This will default to whatever tab is currently active in the List View. Print color in first column only - This option can be used to help reduce the amount of color ink or toner used when printing. The first column when printing will be the same as the first column shown in the associated List view. Columns can be re-arranged or displayed/hidden in the List view. In the example below, the first column is the completion column, which is very narrow and will result in the minimum amount of color ink or toner usage. The Tri-Fold style enables you to print any combination of the Daily, Weekly, Monthly, and Yearly styles on a single page, using 3 equal areas (left, center, and right). You can also choose to include a blank area if you'd like space for handwritten notes on the printout. Left/Center/Right - You can choose the content to include on the left, center, and right sides of the page. After printing, the page can be folded in 3, along the border of each printed area. A dynamic print preview window can be displayed by clicking the "Auto Preview" button. This print preview window will automatically update whenever print setting changes are made. Continue to print by selecting the Print command from the Print Preview window's file menu or toolbar. 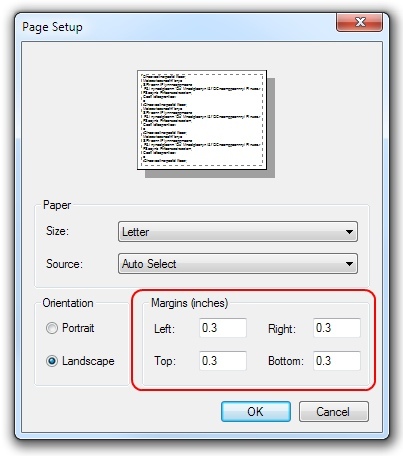 Adjust the paper size, orientation, and margins using the Page Setup menu option. Exit the print preview without printing by closing the window or selecting the Exit menu option. When printing multiple pages, you can switch between them from the thumbnail view on the left, or by selecting the appropriate menu or toolbar options. Zoom in and out, fit the preview pages to the window, and preview multiple pages at once. Use the Snapshot Tool on the toolbar to copy an area of the preview page to the clipboard as an image. This image could then be pasted into other documents or presentations. A Page Setup button is provided at the bottom of the Print window. Clicking this button will cause the following window to be displayed, where the page orientation and margins can be adjusted. The default margin size is 0.5 inches. After you're satisfied with your print layout and page settings, you can click the Print button. 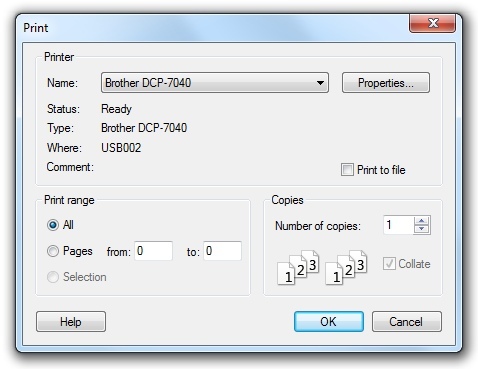 This will cause the following window to be displayed, where you can select the output printer, page range, and number of copies to print. You can also adjust your printer's properties, which will vary depending on your printer model. Clicking the OK button will send the job to the printer.